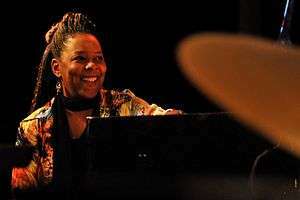 Patrice Louise Rushen (born September 30, 1954) is an American jazz pianist and R&B singer. She is also a composer, record producer, multi-instrumentalist, songwriter, and music director. Her 1982 single, "Forget Me Nots", received a Grammy Award nomination for Best Female R&B Vocal Performance. Rushen had great success on the R&B and dance charts, "Havent you heard" went number 7 on the R&B charts, along with "Forget me Nots" was also a top 40 hit. 1 2 "California Birth Index, 1905–1995 (database on-line)". United States: The Generations Network. 2005. Retrieved 2009-10-06. ↑ "Patrice Rushen MM '76". University of Southern California. Retrieved 2008-10-06. ↑ "Celebrity Author". Toi Moore. Retrieved 2013-10-28. 1 2 "Rhythm & Blues Legend = Patrice Rushen". Mingle City. Retrieved 2013-10-28. ↑ "Paid Notice: Deaths ST. LOUIS, MARIE – New York Times". Nytimes.com. June 15, 1999. Retrieved 2013-10-28. ↑ ""C.A.B." With Bunny Brunel And Tony MacAlpine Live at the Baked Potato". All About Jazz. May 29, 2014. Retrieved September 5, 2014. ↑ Rack, Donald (November 22, 2005). "Indigo Prophecy – Soundtrack Lyrics FAQ". IGN. Retrieved September 5, 2014. ↑ Roberts, David (2006). British Hit Singles & Albums (19th ed.). London: Guinness World Records Limited. p. 476. ISBN 1-904994-10-5. Hogan, Ed. "Patrice Rushen". VH1. Retrieved 2007-05-09.